but now we lay it down to ever rest. Now pause with me a moment, shed some tears. of faithful service, duty done, I weep. Lay down thy packet, now, O friend, and sleep. ^ F. E. HEART, R. E. KAHN, S. 1\II. ORNSTEIN, W. R. CROWTHER and D. C. WALDEN, http://dl.acm.org/citation.cfm?id=1477021, The interface message processor for the ARPA computer network, Spring Joint Computer Conference, 1970. ^ Lukasik, Stephen J. (2011). “Why the Arpanet Was Built”. IEEE Annals of the History of Computing 33 (3): 4–20. doi:10.1109/MAHC.2010.11. ^ Fritz E. Froehlich; Allen Kent (1990). 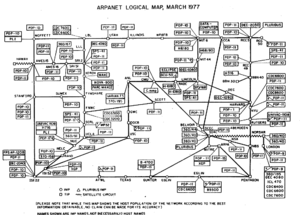 “ARPANET, the Defense Data Network, and Internet”. The Froehlich/Kent Encyclopedia of Telecommunications. 1. CRC Press. pp. 341–375. ISBN 978-0-8247-2900-4. http://books.google.com/books?id=gaRBTHdUKmgC&pg=PA341. ^ a b Stacy, Christopher C. (7 September 1982). Getting Started Computing at the AI Lab. AI Lab, Massachusetts Institute of Technology. pp. 9. http://independent.academia.edu/ChristopherStacy/Papers/1464820/Getting_Started_Computing_at_the_AI_Lab. ^ Kirstein, Peter T. (July–September 2009). “The Early Days of the Arpanet”. IEEE Annals of the History of Computing 31 (3): 67. ISSN 1058-6180. http://muse.jhu.edu/journals/ahc/summary/v031/31.3.kirstein.html. ^ Abbate, Janet (11 June 1999). Inventing the Internet. Cambridge, MA: MIT Press. ASIN B003VPWY6E. ISBN 0262011727. Norberg, Arthur L.; O'Neill, Judy E. (1996). Transforming Computer Technology: Information Processing for the Pentagon, 1962–1982. Johns Hopkins University. pp. 153–196. ISBN 978-0801863691. ﻿A History of the ARPANET: The First Decade﻿ (Report). Arlington, VA: Bolt, Beranek & Newman Inc.. (1 April 1981). http://www.dtic.mil/cgi-bin/GetTRDoc?Location=U2&doc=GetTRDoc.pdf&AD=ADA115440. Hafner, Katie; Lyon, Matthew (1996). Where Wizards Stay Up Late: The Origins of the Internet. Simon and Schuster. ISBN 0-7434-6837-6. Abbate, Janet (11 June 1999). Inventing the Internet. Cambridge, MA: MIT Press. pp. 36–111. ASIN B003VPWY6E. ISBN 0262011727. Banks, Michael A. (2008). On the Way to the Web: The Secret History of the Internet and Its Founders. APress/Springer Verlag. ISBN 1-4302-0869-4. Salus, Peter H. (1 May 1995). Casting the Net: from ARPANET to Internet and Beyond. Addison-Wesley. ISBN 978-0201876741. Waldrop, M. Mitchell (23 August 2001). The Dream Machine: J. C. R. Licklider and the Revolution That Made Computing Personal. New York: Viking. ASIN B00008MNVW. ISBN 0670899763. Feinler, Elizabeth J.; Postel, Jonathan B. (January 1978). ARPANET Protocol Handbook, NIC 7104. Menlo Park: Network Information Center (NIC), SRI International. ASIN B000EN742K. Roberts, Larry (November 1978). “The Evolution of Packet Switching”. Proceedings of the IEEE. http://www.packet.cc/files/ev-packet-sw.html. Roberts, Larry (Sept 1986). The ARPANET & Computer Networks. ACM. http://www.packet.cc/files/arpanet-computernet.html.